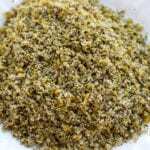 Italian Roast Beef Rub add an incredibly luscious and heavenly flavor to pot roast. Place thyme, rosemary, bay leaves and fennel in a food processor. Process until roughly chopped, about 2 mins. Meanwhile, zest the lemons using a vegetable making sure to avoid the white pith. Add zest to processor and process until finely chopped, about 3 more mins. If using dehydrated lemon zest eliminate second round in food processor. Remove mixture to a med sized mixing bowl. Add in the remaining 5 ingredients and stir well. **Using fresh lemon zest makes for an excellent topside rub for boneless chuck roast. Dehydrated lemon zest works well when covering all sides of roast with rub. ***This rub is PHENOMENAL when used in my Hot Roast Beef Sandwiches recipe.